I know this may seem a little rudimentary, but I am having trouble matching my Blender camera to the settings of a short throw projector. I have my "person" view and I am trying to use two projectors to cover a single, very wide, wall. (Eventually, assuming I am successful with this one wall, I will also do the other three.) However, when I try and use the location in the space where I have calculated the projectors should be, I can't seem to find any setting that allow me to adjust the "throw" of the projector in any of the camera settings. At a distance of 6' from the wall, I should have an image that is 115" tall and 153" wide. The default camera however is only a fraction of this size. Any clues to what I'm missing under camera settings? Sensor width and height don't seem to really be providing me with any useful translations, and all the other settings seem to deal with the render world and not the camera optics. for capturing your wall you need only one camera (since your spectator can only be at one place at a time.) but for the MWS you need to split the wall's object into two objects, one for each projector. If you want to have an overlap, please have a close look at the Videotutorial No 5 (also part of the distribution inside the demo folder) on how to split the wall-object and how to create the softedge object. Sorry, had to step away from this project for a couple weeks to find source footage. Is it possible to share a screen cap of where these setting are located? 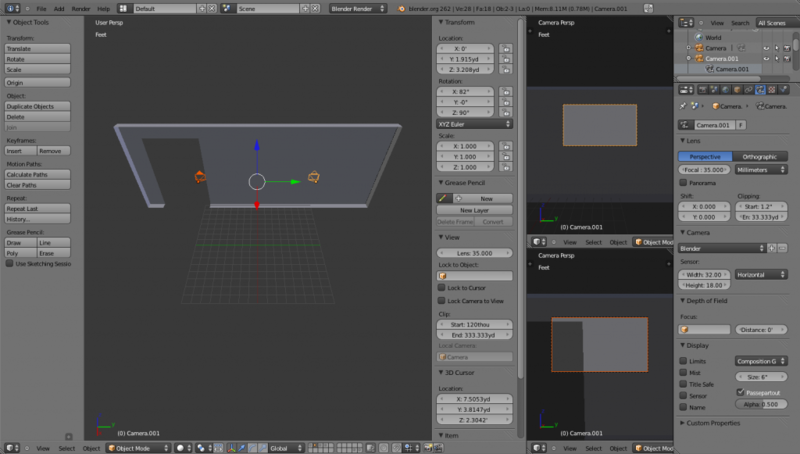 I still get hopelessly confused in the blender interface sometimes.